By Eric Langer and Ilene Roizman, BioPlan Associates, Inc.
One important option discussed was training certification by independent industry- and regulator-recognized accrediting bodies. There are potential benefits to such accreditation/certification, such as establishing and raising standards, increasing consistency, and ensuring proficiency. However, many in the industry view the existing training programs as acceptable, even with their perceived shortcomings. As part of this research into training, in our 15th (2018) Annual Report and Survey of Biopharmaceutical Manufacturing Capacity and Production,2 BioPlan asked global survey respondents about the need for accredited training. This study provides a composite view and trends analysis from 222 responsible individuals at biomanufacturers in 22 countries. Our results show training budgets are on the rise, with a 6.6 percent increase this year alone. 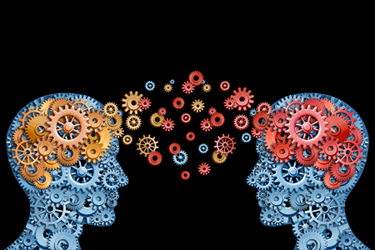 So training is becoming an increasingly important area in bioprocessing. Regarding the types and value of training, respondents noted portability of training is important, and training operators and technicians was ranked third (tied with quality management) among the skill categories perceived to be the most portable between biopharmas and pharma manufacturers. As far as the need to establish an additional level of standard-setting through an accreditation/certification system, though, responses were mixed. Some believed it is critical to better standardize and define the quality of training, while others felt this should be limited to specific qualified areas. It would be difficult and time-consuming to get widespread industry buy-in. The quality and quantity of existing training satisfies most training needs. The wide variability of practices and technologies among biopharma companies would require customized training that can’t easily be standardized. Most respondents acknowledged that accredited/certified training might be more valuable, but the value would need to be demonstrated as compared to existing programs. At the same time, establishing accredited/certified courses might be more important to certain end users. For those new to the industry or switching careers or specialties, basic theoretical and background knowledge along with basic transferrable skills and technologies would be important parts of the training process. A combination of theoretical/background information learned online or in a classroom with practical hands-on learning at a training facility might be best provided by a reputable certifying or accrediting agency. Respondents in GMP environments expressed frustration that companies and training providers have to interpret and apply existing guidelines as they see fit, resulting in variability among programs. One biomanufacturing executive noted there was insufficient real-world training for recent university graduates and industry newcomers, with too much theory and not enough practical training. Others expressed the opposite, that there was too much hands-on training without enough explanation of the fundamentals. Both are likely true, in different circumstances. Among bioprocessing managers, there continue to be complaints about lack of context for basic skills/procedures (the “why” behind how things are done) and insufficient opportunities for practical hands-on training at mock facilities. Several participants called out a need for better basic/lower-level training, along with more public information about programs. One respondent noted there weren’t enough hands-on training centers, requiring some people to travel long distances (and miss work), and that some focus on specific unit operations instead of a wider array of topics. Good programs may be worth the cost if built into a company’s budget. A program that covers the entire process, even if trainings take longer, would be an advantage. Some respondents praised commercial and university training centers that cover both specialized and broad topics with diverse opportunities for hands-on training. Training on how to address regulatory investigations, with an eye toward clarifying standard processes for the entire industry, would be valuable. Also mentioned was a need for training in emerging technologies such as gene and cell therapies. We also asked respondents to identify areas that must be addressed in the future if the industry (not their facilities, as with the preceding questions) is to avoid signiﬁcant capacity constraints (Figure 1). 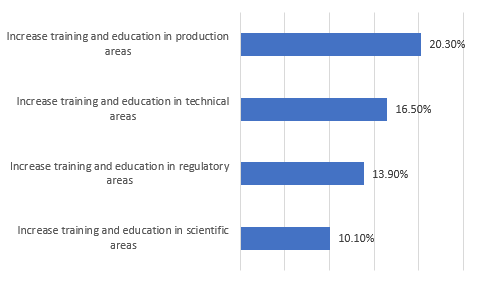 A significant percentage felt there was a need to increase training and education in key areas, including production, technical, regulatory, and scientific, to avoid significant capacity constraints. Fully, one in five respondents see training issues as creating capacity problems. Regarding online versus hands-on training, respondents stressed that you can only learn practical skills by doing, and their preference seemed to be an outside mockup production facility. Some respondents said one benefit of hands-on training is the opportunity to learn how things are done at different companies. Virtual reality is also becoming a more viable option as the technology improves, and it could provide the best of both worlds, remote and hands-on learning. There was general agreement that online training is ideal for background and theoretical knowledge and context, while on-site/hands-on training is critical for learning practical skills. They all felt combining the two could be a good compromise, each bolstering the other. Respondents expressed concern that since practices and technologies vary widely among facilities, customized training can’t be readily standardized, unless the industry is willing to adapt — a significant obstacle in the current biomanufacturing climate. However, even if companies were willing to embrace a reputable, proven, independent accreditation/certification system, many people aren’t interested in such formalized training and are content to rely on existing courses that comply with certain standards. But the lack of accreditation or certification is especially an issue for advanced-level, specialized training. Many believe that because the industry has never been credentialed, doing so now would be a challenge, particularly when it comes to transferability of skills and competencies. There are many differences in biotech facilities in equipment, processes, etc., so someone with knowledge would still require on-site training to reach competence. The bioprocessing industry is continuing to invest in training as it seeks to avoid problems and capacity constraints. And while budgets are increasing, new practices such as online components, standardization, and the development of accredited/certified training have not been adopted yet. Some feel these changes would be difficult to adopt in practice, but as bioprocessing becomes increasingly global, these issues will need to be addressed. Many questions remain, including how to determine the value of such training programs and whom they would benefit, how to gain buy-in from facilities, how to assure high and consistent standards, and how to ease the process of adopting a new training system. “Improving Training through Accreditation and Certification Biopharmaceutical Manufacturing”, BioPlan Associates, Inc., September 2018. Langer, E.S., et al., 15th Annual Report and Survey of Biopharmaceutical Manufacturing Capacity and Production, BioPlan Associates, Inc., April 2018. Eric S. Langer is president and managing partner at BioPlan Associates, Inc., a biotechnology and life sciences marketing research and publishing firm established in Rockville, MD, in 1989. He is editor of numerous studies, including Biopharmaceutical Technology in China, Advances in Large-scale Biopharmaceutical Manufacturing, and many other industry reports. You can reach him at elanger@bioplanassociates.com. Ilene Roizman is communications manager at BioPlan Associates, Inc. She is a skilled writer — able to distill highly technical information in medicine and science. Her medical expertise includes editing of textbooks, as well as research papers for international science and medical journals. The 2018 15th Annual Report and Survey of Biopharmaceutical Manufacturing Capacity and Production yields a composite view and trend analysis from 222 responsible individuals at biopharmaceutical manufacturers and CMOs in 22 countries. The methodology also included over 130 direct suppliers of materials, services, and equipment to this industry. This year's study covers such issues as new product needs, facility budget changes, current capacity, future capacity constraints, expansions, use of disposables, trends and budgets in disposables, trends in downstream purification, quality management and control, hiring issues, and employment. The quantitative trends analysis provides details and comparisons of production by biotherapeutic developers and CMOs. It also evaluates trends over time and assesses differences in the major markets in the U.S. and Europe.